It was January when I last had the opportunity to discuss a DC cover, this is mainly because they have never inspired me outside of the classic superhero posturing. Even Action Comics seems to follow that ilk, but there is so much more meaning and depth and Kuder has brought a few changes to the forefront. The whole landscape is quite unlike the Clark we know and love and has many symbolic features, let alone the fact he is standing against a black background. His posture is quite aggressive, with wide stance and stern expression which we only see in times of great threats. The word truth reflects the revelation of Clark being Superman in the comic, but here plays a nuanced clue to the nature of the man himself. 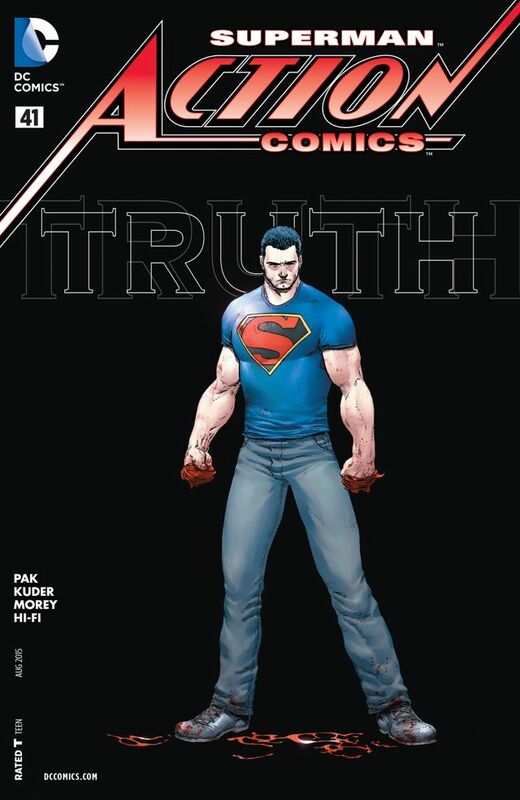 The costume is a great reminder of the beginning of the new 52 Action Comics, where Morales had him in a jeans and t-shirt. But the symbol is starkly different and is a throw back to the early days of the symbol. In fact it was the Superman #4 cover that had this colour arrangement; another historical nod to a classic Clark. What is interesting is that he has ripped up his cape and is wearing it around his fists, which he does in the actual issue. Whether these act as knuckle dusters or increase his power remains to be seen, but what it deliberately looks like is he has bloodied his hands in a moment of rage. You almost don’t want to look at the floor and his trainers, because those aren’t pieces of red cloth, that is blood. The red on black plays an amazing contrast and emphasises the violent nature of this image. This is a Clark post confrontation and he is angry and bloodied. There is a certain degree of uncomfortableness as we spend more time looking at the image. He may appear to be Kal-El but what this page really asks is, who is the real Superman? Next PostThe Theatre List 3/6 – Spoilt for choice!